Craig and Donna Boddington ready for their water buffalo hunt in Australia. I thought about 25 clever ways to write the tale of me and this buffalo. Finally, I concluded the only way to do it right is simply to say Craig Boddington's one hell of a good guy, a good friend and a great coworker. Now let me be clear: All the guys I work with are my special little flowers in their own ways. Mike Schoby is hilarious, loyal, effective and direct. Kevin Steele is funny, idiosyncratic, does the best job of giving me hell, and keeps my eyes open to the beauty and wonder of our locations. And Craig? I work with Craig the most. This is because he books the most interesting hunts and I cherry pick assignments. Craig and I are definitely the odd couple (he's Oscar). He's a very amiable slob who is unflappable. I'm sure he's a genius from listening to him talk about game animals and ballistics. We all know of his achievements, and yet his ego is tame. I've been accused of being the "president and treasurer" of the Boddington Fan Club. There are worse accusations. 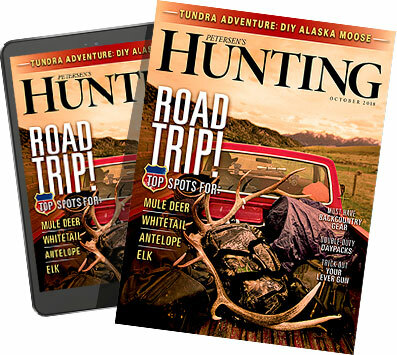 Truth be told, when I interviewed for this job seven-and-a-half years ago, I'd watched exactly 20 minutes of hunting television (an hour prior to my interview) and read exactly zero pages of a hunting magazine. I hunted like I do everything else, and it didn't occur to me to read about it. The point is, the day I met Craig I hadn't a clue who he was. So yes, today I'm one of Craig's biggest fans, but Craig the Man is one of the rare cases of being the same guy as Craig the Celebrity. When Craig called with his bribe, I was scheduled to take my daughter to South Africa with our big annual company safari at Harry Classen's place in the Kalahari. "I need you to come to Australia and tape an episode for my new show in late August." "Can't. I'm going to South Africa with Kevin." "You can shoot a buffalo if you come to Australia." "No can do. Kevin said I can take my kid and I really want her to see Africa before I get fired." "I'm taking Carolyn (his younger daughter) next year. You can bring your daughter and we'll make a show about teenage girls hunting South Africa." I'm sure my daughter would have been just fine seeing Africa for the first time with a bunch of stinky old men from our industry, but I'm also sure she'll enjoy it more next August with another teenage girl. Again, "thanks Craig." Hunting water buffalo with Greg Pennicott is fun. It's also pretty easy. The camp was so far north in Australia that going further north meant drowning and being devoured by crocs. We bounced around on floodplains for a few days, glassing up buffalo, stalking a few, shooting hogs and taping Donna's buffalo hunt. The sun cooked our brains to mush and the truck's bouncing fused our spines into a starving chiropractor's dream. The outfitter took the phrase "a hungry hunter is good hunter" very literally; we ate nothing Day 1, and little while afield after that. Craig and I were on board to take cull bulls, but everything we saw was either too big or too small. The final morning came with a colorful sunrise. We still needed to hunt bantang 12 hours away. Things were about to get flexible. Mid-morning, we returned to an area where a good cull bull was spotted the first evening. What do you know? He was in the neighborhood. The stalk was good but Craig missed him with the first three shots. Ha! Just kidding. He took the bull nicely with some fancy shmancy double rifle. I was up to bat. The good eyeballs guiding us watched a bull disappear into a mud hole toward the edge of the massive plain. The landscape appeared very flat, but buffalo would nonetheless appear and disappear. We stalked in the direction of the hole, and due to the time crunch, a big cow was now on the menu as we cut distance. Donna ran the camera as we all stumbled through the grass clumps. The cow spotted us killer apes and our tools, and wisely ambled off. We neared the hole and the muddy bull reappeared. He stopped to make sense of the situation. I shot and hit a touch lower than the location suggested by the guide, but it was a good killing shot, and after a couple insurance policies the bull went down very near the mud hole. Good friend Susan Hagen assembled an excellent gallery of images you can find on Craig's Facebook page. If you haven't tuned into The Boddington Experience, you need to. It's good. Let's do some quick math: Boddingtons know-how + my mad camera skills + incredible locations = yep, you should check it out.